I’ve been test-driving a new tool over the past couple of weeks, and it’s fantastic! 1. You can seamlessly integrate all of your social networking into the browser’s sidebar. Set up your Twitter, Facebook, and pretty much anything else you might use (You Tube, Flickr, Photobucket, etc…), and you can see what’s going on all the time without needing to even flip between tabs. You can also post to Twitter and Facebook through the sidebar, or drag-and-drop your photos into the sidebar for immediate upload to Facebook, Picassa, Flickr, Photobucket, or whatever photo-sharing method you use. 2. It also works as a blog reader (again, teasers are shown in the sidebar). 3. It has an awesome web-clipping feature. Let’s say you see something while you are out browsing the web that you want to write about, or a photo that you think would look great in your next blog post. You simply highlight it, open up the “Web Clipboard” sidebar, and drag and drop it in. So much easier than bookmarking. 4. 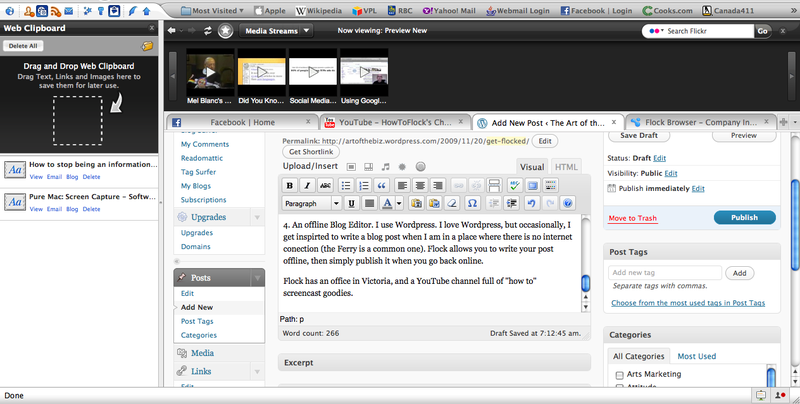 An offline Blog Editor. I use WordPress. I love WordPress, but occasionally, I get inspired to write a blog post when I am in a place where there is no internet connection (the Ferry is a common one). Flock allows you to write your post offline, then simply publish it when you go back online. Flock has an office in Victoria, and a YouTube channel full of “how to” screencast goodies. Click here to download Flock. Sounds interesting! I will give it a try! Wow. This looks *reaaaaly* promising. If nothing else, it helps compartmentalize social media management in my workflow, which I think will be VERY good for my sanity. 1) Doesn’t support multiple twitter accounts. But that said… in a couple minutes I got a LOT of my digital life in one place. That felt really really good. Importing Google reader feeds, got facebook going. And there’s more. I like tools that combine features. One of the hardest things to deal with as our global culture gets all webbed out is that the way we use the web constantly proliferates and becomes more complex. Too complex for human brains to process, even. It’s nice to see software that truly works against the Babel effect. Rebecca, I am in love with Flock, and not just because my godson is CEO. I am a bit technologically challenged, so I don’t do all the sophisticated things many of you do. Flock seems friendly to me, and feels smooth compared to Firefox or Safari. Not exactly concrete data! If you have concrete suggestions, however, or if you find glitches, please let me know and I’ll pass your comments along to Shawn (Hardin, the aforementioned godson). He really wants to hear what people are thinking about Flock, and asked me to check it out within my network. So far I am surprised at the number of people who are not using it. Thanks, Ann. This is what I love about the world right now, and social media. Companies are so much more accessible, and open to hearing feedback. I think it’s really great, and I like it a lot. Well said, Rebecca – I completely agree. I hope that some of your readers will respond, because Shawn is serious about feedback!